Discover a growing selection of primary links for elementary students. Use our contact form to suggest sites not currently listed. ABCYA.com – provides free educational kids computer games and activities for elementary students to learn on the web. Astroblast – Sputnik, Halley, Radar, Comet, and Jet are five fun-loving animals who live with their alien octopus friend Sal in the Astroblast Space Station, which also houses a large library and a smoothie cafe called the Frosty Star. Babar – Babar and the Adventures of Badou follows the adventures of Babar, who along with his friends, solves numerous mysteries, puzzles and situations. The Backyardigans – Join the Backyardigans in their worldwide journeys of imagination, dance, and musical styles. Ben and Holly’s Little Kingdom – Young fairy princess Holly and her best friend, Ben Elf, live in Little Kingdom, a tiny land where flowers and grass grow above the tallest towers. The Berenstain Bears – A charming animated comedy celebrating furry family values and good old-fashioned Bear Country living. Big Block Singsong – Every BIG BLOCK SING SONG features a unique character that sings their very own song. Highlights from BBC Bitesize – brilliant resources for primary, secondary and adult learning. Blaze and the Monster Machines – Blaze and the Monster Machines is an educational American CGI interactive animated television series. Blue’s Clues – Let’s play Blue’s Clues with Steve and Joe, Magenta, Mailbox, and Periwinkle. Bob the Builder – Get to know all about Bob the Builder and the benefits of building, find free activities, and other interesting stuff. BOJ – Find out about Boj & his buddies, watch Boj episode clips, play Boj games & Apps, download colouring in and Boj-ey activities! Boj is showing on CBeebies. BrainPOP® Jr. – creates animated, curricular content for grades 2-3. Bubble Guppies – Bubble Guppies is an American preschool children’s television series produced for Nickelodeon and created by Jonny Belt and Robert Scull. Bunny Town – Visit the Bunnytown website to play games, watch videos and print coloring pages. Caillou – Designed for preschoolers, the Caillou website and television series features everyday experiences and events that resonate with all children. Can You Teach My Alligator Manners – Mikey encourages viewers to help him teach his scaly best friend how to behave properly. Captain Jake and the Neverland Pirates – The series focuses on a band of young pirates consisting of Jake, Izzy, Cubby and their parrot Skully, who continuously spend their days competing against Captain Hook and Mr. Smee for treasure. The Chica Show – A Sprout Original series that features animation and live-action, and follows the playful experiences of Chica the Chick and Kelly. Chloe’s Closet – Chloe’s Closet follows the everyday adventures of a young girl named Chloe and her friends, who exist in a world where they believe anything is possible. Chuggington – A British children’s computer-animated television series produced by Ludorum plc. Clangers – Get to know the whole Clanger family and all their friends: the Soup Dragon, the Froglets, the Iron Chicken and the Sky Moos. Dance A Lot Robot -A combination of animation and live-action, “Dance-a-Lot–Robot” stars Dance-a-Lot, a robot with rhythm. Dino Dan – Join Dino Dan and Trek on their missions to study dinosaurs. Disney Junior – Home for Playhouse Disney and Disney Preschool. Find fun videos, games, activities, and more! Doc McStuffin’s Pet Vet – Doc McStuffins fixes broken toys in her backyard playhouse clinic with the help of her friends Hallie, Lambie, Chilly, and Stuffy. Dora and Friends – Together with the explorer girls Emma, Kate, Naiya, and Alana and her only male companion, Pablo, Dora and her friends work together and go on amazing adventures. Dora the Explorer – Explore with Dora, Boots, Backpack, Map, and Swiper! Watch Dora full episodes, playDora games, and learn Spanish words. Earth to Luna – Earth to Luna follows the adventures of a 6-year-old girl, who’s completely passionate about science & the exciting process of scientific inquiry. Ella the Elephant – Visit the Ella the Elephant website to watch videos and print coloring pages. Floogals – Fleeker, Flo and Boomer are pocket-sized alien adventurers on a mission to observe, experience and detail the new and exciting world around them. Fresh Beat Band – Dance, sing, and teach your preschooler all about music with the help of the Fresh Beat Band! Fresh Beat Band of Spies – Join the Fresh Beat Band of Spies on their coolest cases. Watch full episodes and hilarious videos, dance to their music and play the freshest spy games around. Fuzzy Tales – Visit the Fuzzy Tales website to watch videos and print coloring pages. Go Diego Go! – Join Diego, Alicia, Map, and Baby Jaguar on their scientific mission to rescue animals. Watch full episodes and play games about science, animals, and nature. Goldie & Bear – Watch the official Goldie & Bear online at WatchDisneyJunior.com. Get exclusive videos and free episodes. The Goodnight Show – The GoodNight Show is designed to help preschoolers wind down. Handy Manny – Watch Manny and his talking tools teach kids how to confront and conquer everyday problems. Henry Hugglemonster – Visit the Henry Hugglemonster website to play games, watch videos and print coloring pages. Julius Jr. – Julius Jr. has a penchant for invention and discoveries. Watch full episodes and video clips, play Julius Jr. games and download inventive printable fun. Jungle Junction – Deep in the heart of the jungle lives a colorful company of animals that have wheels instead of feet. Kate & Mim-Mim – Kate and her stuffed toy friends use their imaginations to go on wild and incredible adventures. Lalaloopsy – Join the buttoned-up friends of Lalaloopsy on their fun-tastical adventures. Watch full episodes and play online games. Lazytown – LazyTown is all about entertainment for kids and dedicated to promoting healthy lifestyles for children in a catching way with the tips from super-hero Sportacus! Lily’s Driftwood Bay – Lily’s Driftwood Bay follows the life of a five-year-old girl named Lily, who uses her imagination to create a world of adventure & friendship. The Lion Guard – The Lion Guard is an American animated television series created by Ford Riley based on the 1994 film The Lion King. Little Charmers – Join the Little Charmers for magical moments and exciting adventures. Watch full episodes and clips and play games with Hazel, Lavender, and Posi. Little Einsteins – Visit the Little Einsteins website to watch videos and print coloring pages. Max and Ruby – Join the adventures of funny bunnies Max and Ruby. Watch full episodes and hilarious videos and play dress up games and sports games. Maya the Bee – She’s No Ordinary Bee! Follow Maya the Bee and her insect friends on their adventures outside of the hive. Mia and Me – Enter the magical world of Mia and Me and join her in their quest to save the unicorns. Watch their full episodes and video clips and enter Centopia. Mickey Mouse Clubhouse – Watch Mickey Mouse Clubhouse every morning at 8am/7c on Disney Junior on Disney Channel. Mike the Knight – Watch Mike the Knight full episodes and video clips and play dress up games. Miles from Tomorrowland – Miles From Tomorrowland takes kids deep into the universe, exposing them to the wonders of outer space – and the joys of family. Minne’s Bow Toons – Minnie Mouse has a passion for fashion, along with good friend Daisy Duck, of Minnie’s Bow-tique, a specialty shop that sells only bows and bow ties. Mother Goose Club – Watch nursery rhymes videos, crafts & songs with Mother Goose Club characters Jack B. Nimble, Teddy Bear, Eep the Mouse, Mary Quite Contrary & more. Mutt & Stuff – Watch episodes and clips of Mutt & Stuff, a show about an extraordinary school of dogs. Muppet Moments – Visit the Muppet Moments website to watch videos and print coloring pages. Nick Jr. – Play preschool learning games and watch episodes and videos that feature Nick Jr. shows like Paw Patrol, Blaze and the Monster Machines. Nina Needs to Go! – Nina Needs to Go! is a Disney Junior animated series that takes the title character 4 year old Nina to a variety of settings like the zoo and the beach. Nina’s World – Nina’s World tells the story of imaginative 6-year-old Nina and best friend, Star, having everyday fun within her vibrant and colorful neighborhood. Octonauts – The Octonauts are an adventure team who explore the world’s oceans, rescue the creatures who live there. Pajanimals – A musical children’s television series produced by the Jim Henson Company. Paw Patrol – Join the PAW Patrol in Adventure Bay through episodes, games, video clips, and more. 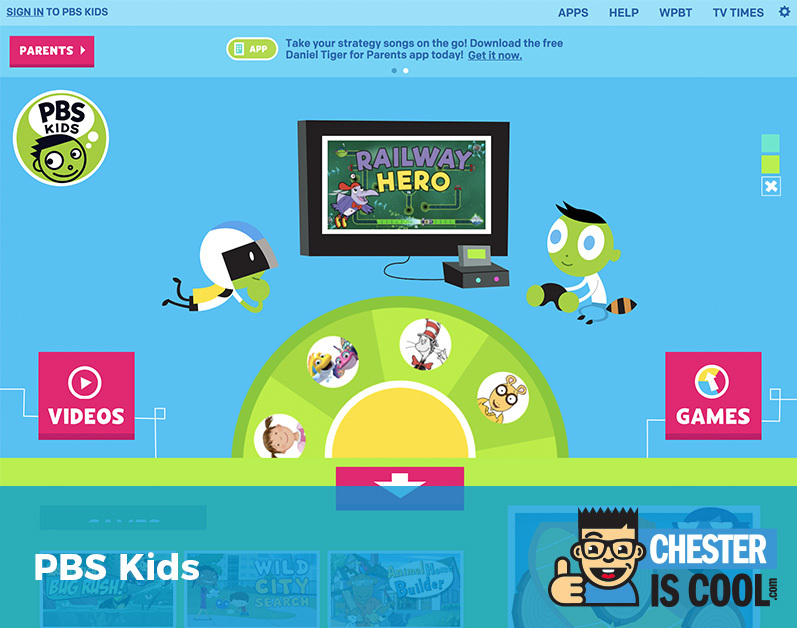 PBS Kids – Play educational games, watch PBS KIDS shows and find activities like coloring and music. Peppa Pig – Join Peppa in adventures that teach kids about friendship, cooperation, and feelings. Peter Rabbit – Join Peter Rabbit, Lily, and Benjamin on their adventures in the lush Lake District. Watch full episodes and video clips and play challenging and fun games. PJ Masks – A French animated preschool television series produced by Entertainment One, Frog Box, and TeamTO. Poppy Cat – The official site of the pre-school TV and book series. Play games, watch clips, and learn about Poppy Cat and her friends who make adventures extraordinary! Prongo – Collection of fun educational games. Ruff-Ruff Tweet and Dave – A Sprout original series that follows best friends Ruff–Ruff, Tweet, and Dave on a day of adventure, discovery and play. Sarah & Duck – Seven-year-old girl named Sarah lives with her quacky best friend, Duck. During each episode, the pair embark on simple but exciting adventures. Sam Sandwich – Watch Sam Superhero Sandwich defend the planet Earth from junk food villains. 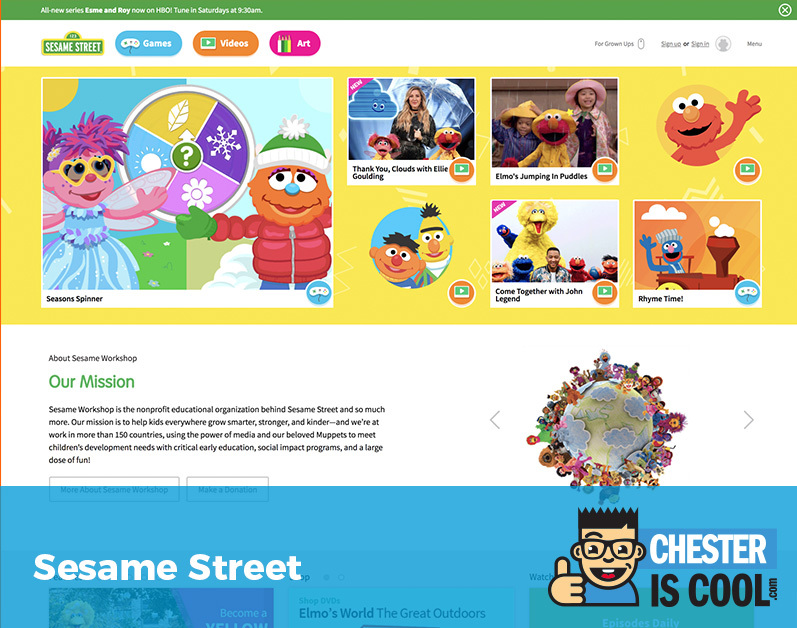 Sesame Street – Play educational games, watch videos, and print coloring pages with Elmo, Cookie Monster, Abby Cadabby, Big Bird, and more! Seussville – Featuring games, printable activities and a complete illustrated character guide. Sheriff Callie’s Wild West – Visit the Sheriff Callie’s Wild West website to watch videos and print coloring pages. Shimmer and Shine – Go on magical misadventures with Shimmer and Shine! Play games and watch episodes and clips that teach the power of problem-solving skills. Small Potatoes – “Small Potatoes” introduces a rocking quartet of musical spuds who sing, dance and rock their way through entertaining music videos and comedy sketches. Sofia the First – Sofia the First is an American computer-animated television series that incorporates characters from the Disney Princess franchise. Special Agent Oso – “Special Agent Oso” is a lovable special agent in training. In each episode Oso receives his “Special Assignment” to help a kid with an everyday task. Stella and Sam – The nine-year-old girl named Stella is the hero & superstar in the life of her four-year-old brother Sam. 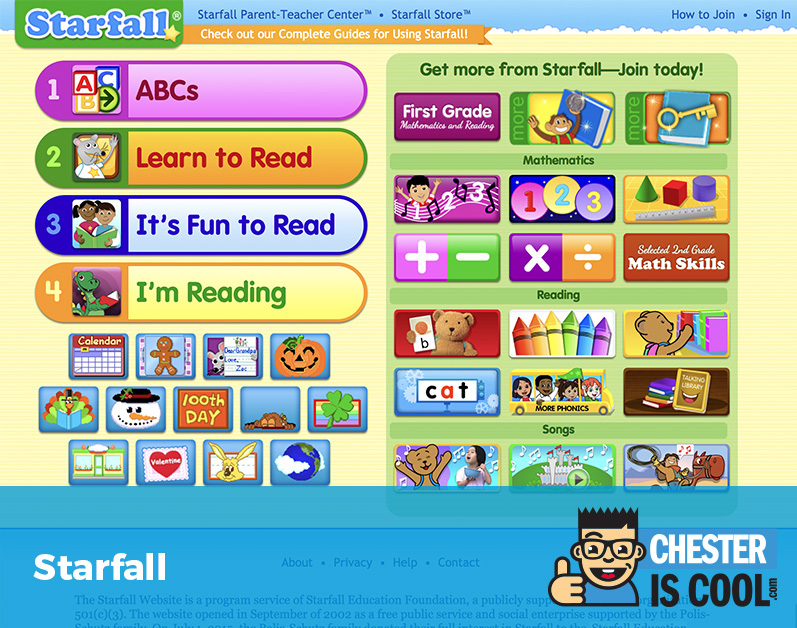 Starfall – A free website to teach children to read with phonics. For preschool, kindergarten, and first grade. Story Online – Colors. Word Machines. Backpack Bear’s Books. More Phonics. Short Vowel Pals Vowel Pals. The Sunny Side Up Show – The only LIVE morning show for preschoolers encouraging viewers to spend the morning playing games, making crafts & more. Super Wings – Adorable jet plane named Jett travels around the world delivering packages to children. Explore different countries & learn the diversity of new cultures. Sydney Sailboat – Learn how to ride the waves of life along with Sydney and the other vessels. Tasty Time with ZeFronk – A series of shorts starring ZeFronk, a French wiener dog who hosts a cooking show from inside his doghouse. Team Umizoomi – Team up with Team Umizoomi for math-minded games and count the ways Geo, Milli and Bot teach math, shapes, counting, and patterns in full episodes. Tickety Toc – Join Tommy and Tallulah in their race to beat the clock in time for Chime Time! WatchTickety Toc full episodes and videos, and play Tickety Toc games. Tree Fu Tom – Tree Fu Tom follows the amazing adventures of Tom who, with the ability to travel to the secret miniature world of Treetopolis, a tiny city in a tree. Wallykazam – An American children’s animated television series created by Adam Peltzman. Whiskers Haven Tales – Watch the official Whisker Haven Tales online at WatchDisneyJunior.com. Get exclusive videos and free episodes. Wonder Pets – Play games and watch full episodes and clips of this groundbreaking musical show that teaches kids about teawork, sharing, helping others, and being a good. Yo Gabba Gabba! – DJ Lance Rock, Muno, Plex, Foofa, Toodee, and Brobee in Gabba Land. Zack and Quack – Resourceful 7-year-old Zack lives in a pop-up book with best friend Quack, a curious young duck. Zerby Derby – Follows the lives of pint-sized cars who live & play in a real-life-sized forest. Follow Zack, Lily, Rex & Axle on their adventures. Zou – Follows the life of a young zebra who lives with his family in a very large zebra house. Each day brings a new sense of discovery and exploration.